PC Tuneup software can take windows performance to the next level. Windows OS offers plenty of tools to optimize and manage your computer’s hardware and software but there are some free programs that offer better and advanced optimization features. We’ve shared a comprehensive review of CCleaner, SlimCleaner and System Mechanic. These 3 applications are very efficient in removing junk from your computer. They’ll fix registry problems too. Today, we’ll make you aware of Glary utilities, a free windows optimizer. 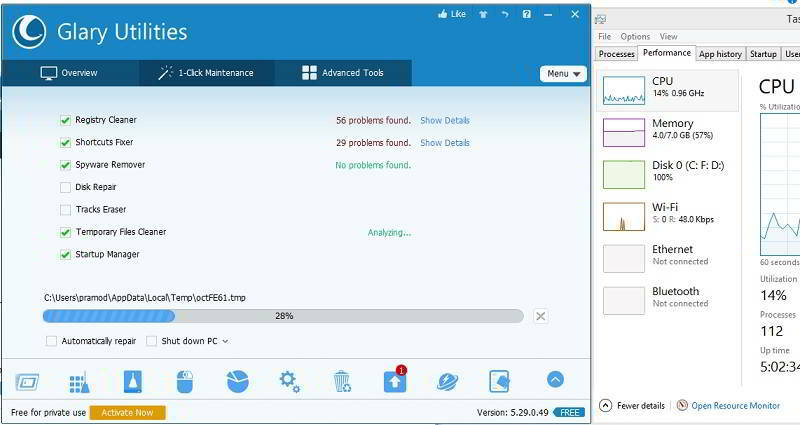 Glary Utilities is software bundled with plenty of small tools to fix various computer related problems. You can run it in Microsoft Windows family of operating systems. How to use Glary Utilities? Open the installation wizard of this program by running its setup file (download link). The wizard will prompt you to accept the license agreement. It will also present options for creating quick launch as well desktop shortcut icons. The disk spaced used by the software is 40 megabytes. Remove privacy-related data immediately before windows OS shuts down. Find updates all installed programs. The 2nd column shows your system’s expected boot time. It also features an utility to disable running of some processes during startup. This utility will display a list containing all active background processes along with their details and a toggle button to enable/disable their startup. Thus, you don’t have to run servicemgr.exe or MSConfig. There’s an add program button to add processes that are not displayed in the list. The 3rd column flaunts the application details i.e version number, last updated date, and type (free or premium). Malware remover: This tool allows you to find and remove malware from your computer. It will scan all important folders to find harmful applications that are quietly residing and damaging your system. Driver manager: If you have installed Glary utilities on your PC, you don’t have to worry about outdated device drivers. This utility will scan all hardware configuration files and it will update them if required. Before you update the driver, you are allowed to create its backup copy. Find undelete: Use this tool to restore permanently deleted files and folders. Splitter and joiner: This module allows users to create smaller files from larger ones. You can specify the size before running the splitter. The chopped files can be joined through the same interface. I tried to split a CSV document into 2. The files were split but I was not able to access its data. File security: With this tool, you can create a password protected the encrypted file from an existing one. You can configure the file’s behavior when the user enters wrong passwords. For example, if a user is trying to access the encrypted data by repeatedly entering fake passwords, the file can automatically replace its data with random texts. This software also features a decryption tool to reverse this operation. The file can be opened only with Glary utilities. Memory optimizer: If your system doesn’t have enough free RAM to run other software, use this utility. Memory optimizer allows you to choose the volume of RAM you want to free. You can configure it to free the system memory automatically. It also features an option to clean data copied to the system clipboard. Context menu manager: This utility allows you to enable, disable or remove shell extensions of Windows applications. It displays some vital information of the extension as well. Browser assistant: This tool in Glary utilities allows you to manage browsers without opening them. You can remove extensions, default search engines, cookies, history by clicking on the remove items button. Users can also set a start page for their Chrome, Internet Explorer or Firefox browser. Tracker eraser: This utility will remove every object that tracks your activity and location. 1 click maintenance: Run this tool to fix registry errors, broken/irrelevant shortcuts, and other system problems. This scanning process is slower as compared to 1 click maintenance of other PC tune-up software. As you can see in the below screenshot, the progress bar was stuck on 28, 78 and 85% for several minutes. Overall scanning operation was complete in 1.2 hours. Conclusion: Glary Utilities has a lot of useful optimization features. This software is CPU and system memory friendly but sometimes, its scanner stops working or freezes unexpectedly. Its encryption tool is good but to access data from the encrypted file on other PC, you need this software. The driver backup tool works well. Glary Utilities isn't a disappointing software. It has a simple UI and useful tools. Its alternative and competitor SlimCleaner has a slightly better rating because its performance was as smooth as butter.